Please Don't Be Mine, Julie Valentine! please dont be mine, julie valentine was written by Todd Strasser. 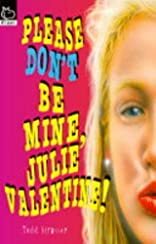 please dont be mine, julie valentine was published by Scholastic Paperbacks.